Are you ready for a Labrador? 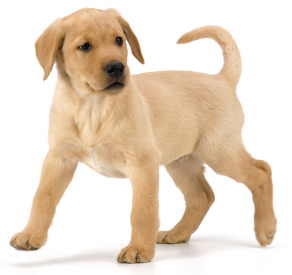 Home Choosing a Labrador Are You Ready For A Labrador? Are you ready for a Labrador? It is hugely exciting, isn’t it? Maybe you have thought about it, mulled it over, for weeks or months already. Or perhaps you are feeling spontaneous right now. [wp_ad_camp_5]And just want to ‘go for it’. Once I have made up my mind to do something, I want to do it right here and now! Should you get a Labrador spontaneously? Maybe you are tired of endless discussions every time you want to buy something, or do something. After all, life’s too short to waste time worrying about what could go wrong. Maybe you are tempted just to ‘turn up’ at home with one of those pups that are advertised in the local paper. The kids would be blown away, wouldn’t they! How hard can it be to look after a dog. Everyone else seems to manage OK.
Actually, many people who buy a Labrador spontaneously, from a friend, or an advert, do not manage OK. And there are important factors that can profoundly influence how you cope and whether or not you enjoy your new friend. The truth is, that without planning and preparation, many people struggle with their new life as puppy parents, and find themselves completely out of their depth. Their puppy bites and scratches the kids, pees all over the carpets, and keeps getting sick. Vets bills mount up. And early obedience training falls apart just as they need more control because the dog is growing big, and very strong. In fact, the sad truth is that many Labrador puppies end up abandoned at rescue centres just a few short months after they were so enthusiastically welcomed into their new families. For reasons that could have been entirely avoided. Before you take the plunge, it is really worth taking just a minute. Take a pause, and ask yourself a few questions. Do you know anything about Labradors? Do you know how much they eat? Or how much exercise they need? Do you have time to train a Labrador, and are you prepared for the mess he will make in your home? Do you know how to cope with a puppy whilst working long hours? Have you made day care arrangements for when you go back to work? You’ll find some key information in these two articles. Please, take just a minute to read them. You may find you are indeed the right person, to have a Labrador, and that this is the right time to bring a dog into your life. But it really is worth checking this out first. There is more to owning a Lab, than you might think. Sometimes, the right decision is to put your plans on hold, to wait until you are at a different point in your life. Sometimes, everything you read just confirms that for you, this really is the right time. [wp_ad_camp_2]But you won’t know for sure, until you have gathered all the information that you need. There is a right way and several very wrong ways to find your dog. 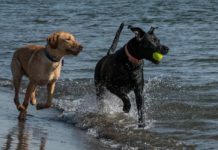 So if you decide you are ready for a Labrador, do check out our resources for finding the right one. You’ll find lots of information in the puppies section. You probably know that Labradors can get sick, and that sick dogs are expensive. But did you know that you can greatly influence your chances of a healthy dog by the way you go about finding him? If you are not sure whether to buy a puppy or adopt a rescue dog, check out this section: Should you rescue or buy . 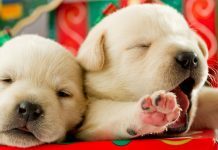 It contains really important information that a lot of new puppy buyers are simply unaware of. Such as crucial health tests that your puppy’s parents must have passed, and the importance of collecting your puppy at the right age. Don’t be caught out. Arm yourself with information and make the right choice. You won’t regret it. If you enjoy Pippa’s puppy articles, you will love her new book: The Happy Puppy Handbook – a definitive guide to early puppy care and training. 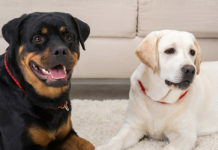 Do Labradors Need Friends: Should I Get A Second Dog?